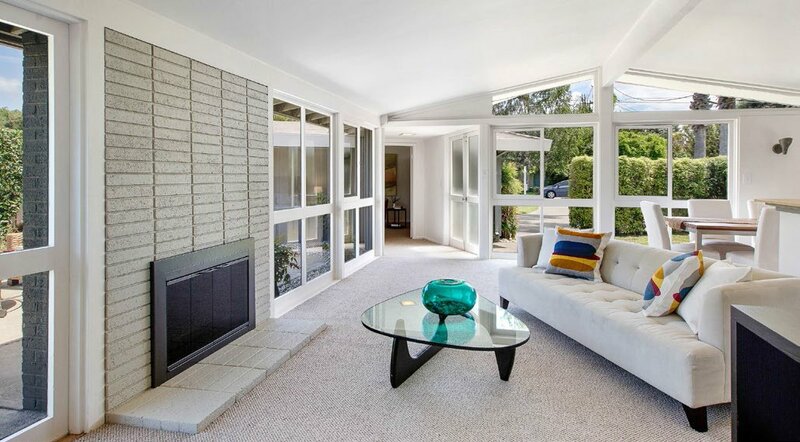 These three house photos, all of the same residence, are from a recent Marin Modern Real Estate listing in Orchard Park, Novato’s other Cliff May neighborhood. 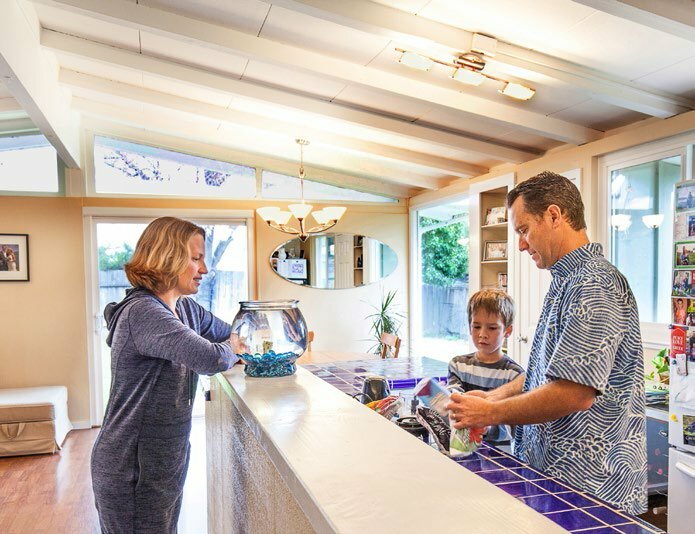 The Havel family (L-R: Melissa, Declan, and Curtis), who have lived in their Cliff May-designed home in Novato’s Ferris Gardens for five years. Few architects have made a mark on suburban living more than Cliff May, and he never trained as an architect. Getting his start in San Diego in the 1920s designing low-slung Spanish Colonial ranches, he won fame through Sunset magazine, which, in the mid-century, published many of his designs as covers, and published several of his books about ranch houses. His ranches soon grew modern in look, and by the early 1950s he and younger partner Chris Choate were turning out thousands of small ranch-like modern homes in dozens of tracts. May and Choate were the developers of some; others were built by folks who bought May and Choate's plans. It's not clear which category Orchard Park and Ferris Gardens fall into. These are beautiful little houses entirely characteristic of May and Choate—board and batten or other wooden siding for an informal look, L-planned with glass opening from living and sleeping areas onto a patio hidden from the public by fencing, gate, and carport. The homes boast a simple, flowing plan, which features a living room, dining area, and kitchen formed essentially as a single room. Originally the homes had French doors. Many have been replaced by aluminum sliders. Orchard Park, the older of the two tracts, circa 1952 with about 60 homes, has suffered the greatest depredations, with many homes expanded, made to look like quaint cottages, or in one case turned into a two-story Arts and Crafts house. Although the originality of a number of homes can't be assessed because they hide behind forests of plantings and fences, this looks like a tract that's unlikely to regain its Cliff May feeling. 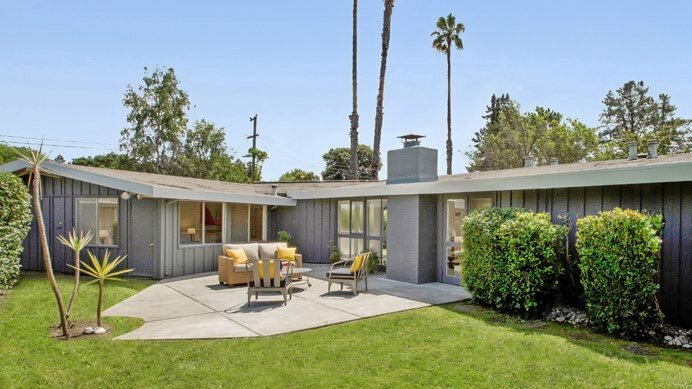 That said, any number of homes look fairly original from the outside, and some owners have worked on them in a way that shows an understanding of their mid-century modern flavor. Grove Lane, in particular, has original homes and homes that may be easy to restore to their original looks. Ralph Stancato, who has lived in his 1,400-square-foot, three-bedroom home on Grove Lane since 1983 and raised a family there, knows nothing about its architectural heritage. But he has appreciated the home for all the features May provided—its openness, light, privacy, he says, "and it was affordable." May, who cared more about the functions of his homes than pure aesthetics, would have been pleased. Stancato's next-door neighbor, Abigail Walsh, whose home, like Stancato's, remains largely original, has lived there since 1970. She particularly appreciated how the courtyard, which is surrounded by the home, carport, and a fence, provided her children a safe place to play outdoors. A mile away, a roughly 60-home Cliff May neighborhood in Ferris Gardens, built several years later, has many more original-looking homes. Moreover, a growing number of homeowners there care about preserving the neighborhood's architectural integrity against such changes as second stories. Neighbor Jennifer Schauer notes that many homes have been expanded. That can work, she says. "But it's like totally weird when people add that second story. It totally changes the look." "We have a neighborhood full of relatively modest homes, and people walk out of their homes and they talk to each other," says Schauer's neighbor, Curtis Havel. "We have a really nice community fabric." 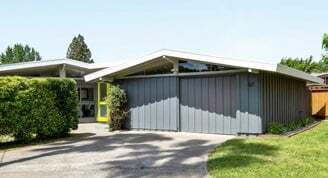 • The Cliff May homes of Orchard Park are north of Tamalpais Avenue, on Grove Lane and Orchard Way, with a few on Center Street. The approximately 50 May homes of Ferris Gardens are on Ferris Drive and Nova Lane, with a few on Carolyn Way.